I’ve played the Bravely Default demo. I’ve played (but only nearly beaten) Bravely Default. 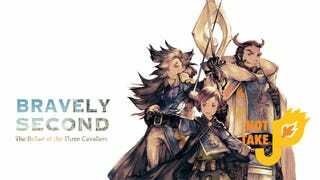 I came into the Bravely Second: The Ballad of the Three Cavaliers demo already knowing that I’d enjoy the gameplay. Bravely Default has been endlessly reviewed, and endlessly praised. Bravely Second turned out to be a refinement of what made the first great. This demo wasn’t going to convince me to buy the game. I already know I’m going to eventually. For me, it’s job was to be a worthwhile experience on it’s own. The story served it’s function. There never was a real over-arching theme, though they did touch on some great evil-sandstorm-thing which seemed to drop little breadcrumbs for the main game’s story. It was fun, appetizer of a quest, which is fine, it is a demo after all. The writing is pretty superb. It never got heavy because of how light the story was, but the humor was on point. They even included a few “adult” zingers, like when one character references being a “Ba’al buster” (Spoiler, Ba’al is the name of the final boss in the demo). All the fantastic gameplay of the original is back. We get access to four jobs at first and access to more as the demo progresses. The demo gives us the old standby abilities plus a taste of a few new jobs like the new support mage-like “Astrologian”. There are bonuses for completion that transfer into the main game. I think this is a huge perk of demos and I think developers that decide to do demos should add it. That extra little incentive to buy the full game. All in all a decent demo. It accomplished what every demo strives to do, whet my appetite for the full game. It never felt like the demo wasted my time with filler. It might even convince some of you with 3DS systems who are interested in a good RPG. Definitely play it if you have or plan on purchasing Bravely Second. The bonuses are minimal but something is better than nothing! Developers already have a lot on their plate. Entitled gamers like us don’t need to be asking for more, but somehow many of us feel like we deserve more. We ask for certain kinds of games, certain kinds of DLC, and sometimes we even ask for demos (I’m as guilty as anyone else). Yeah, game demos are uncommon nowadays, but with the intense cost of development most studios, especially smaller ones, can’t afford the time and manpower to develop one. I was recently watching a developer stream one of their games and they said something that should be obvious, game demos aren’t just cut and paste snippets of game code. They are games developed in and of themselves. So when I do get the chance at a demo I am grateful. And when a demo does what it’s supposed to do, sell a game, I’m especially happy about it. I’m not saying gamers aren’t allowed to want a decent demo, just don’t feel like any company owes you one.